Last week when Jennifer was asking me what I wanted for my birthday, I had no idea of what to tell her. I’ve been wanting my own home office for quite a while and it didn’t even dawn on me until I saw one of the Featured Workspace articles on Lifehacker. It was simple and nicely organized. When I saw the pictures, I knew this is what I wanted. Jennifer spent the past several months painting the interior of our house and I knew that I could probably convince her to paint one more room. She was just excited that I wanted to use my birthday money on the house. We told everyone to send money and we did a quick tally before heading out to IKEA. 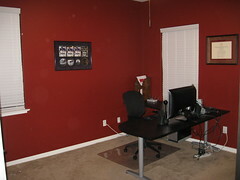 I settled on the Galant desk system which allows you to put together several pieces into a very sturdy desk. 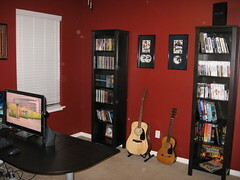 We added a couple of bookcases and some red paint and started to work. I’ve received many questions on “why red and not burnt orange”. While burnt orange would have been a great color, I do have to work in the office and I’m not sure I could stand such a bold color for that long. I tell myself that it’s Houston Astros “brick red” and that’s enough for me. Jennifer spent all day Friday and Saturday painting and did a great job. Late Saturday, I started putting the Ikea furniture together and quickly the rest of the room came together. I would like to thank Jennifer for all the hard work she did in painting and also that she gave up her share of the office so that I can have my own space. It’s a great birthday present. I love you, Dear. Thank you. At the suggestion of Abby’s counselors, we entered her into a county sponsored summer reading program. It was four weeks long and ran Monday through Thursday. Abby passed to the fourth grade by the skin of her teeth and it was our hope that this would help boost her reading skills. My only problem with the program was that I had to get her to a bus by 7:00 in the morning. It was a small price to pay, but this was supposed to be summer. I was wanting my extra 30 minutes of sleep in the morning before going to work. Anyway, it appears that it has helped. We’ve been reading the Magic Tree House series of books and tonight I could tell she was reading a lot better. 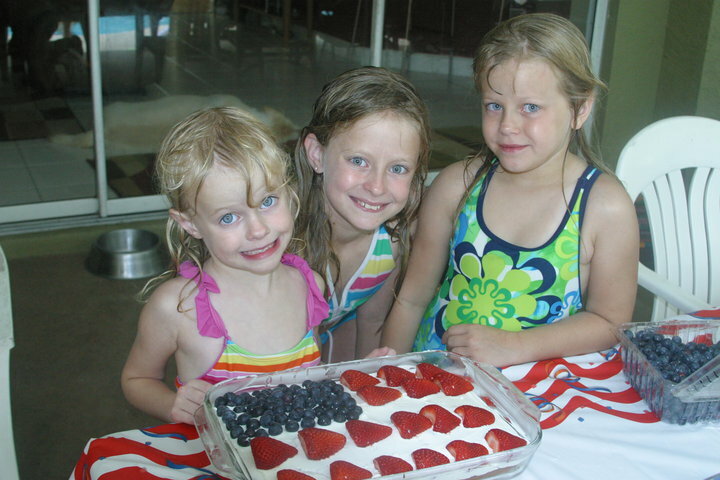 Meanwhile, Emily and Izzy have been attending swim lessons for the past three weeks. Izzy has already “graduated” up one class. Although that isn’t saying much, for her age group. I think the different is whether or not they get their head wet. I can tell Emily has gotten a renewed confidence in the water. She used to not go anywhere without hanging onto my back. Now she’ll jump in and swim back to the ledge no problem. She didn’t have near as much confidence at the beginning of the summer when we were hopping down to Disney to go swimming in their pools.